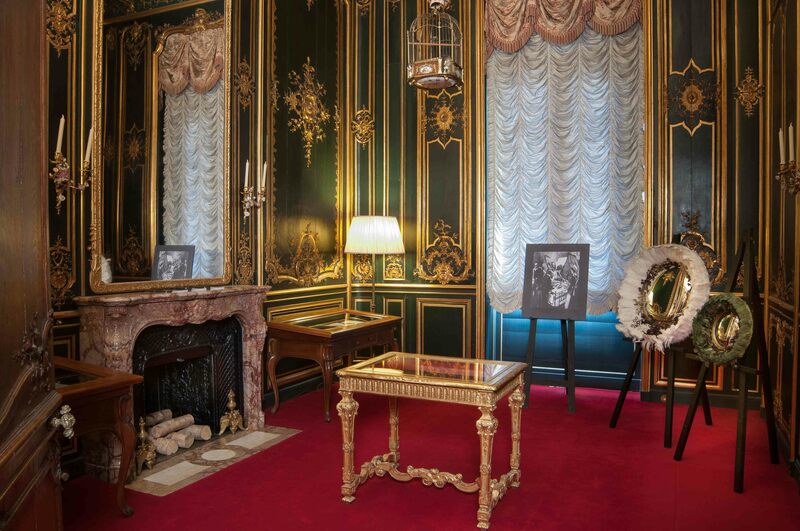 It is appropriate that the State Bedroom and the adjoining Green Boudoir should be the centre for this installation which emotively explores the theme of loss, mourning and love, as the bedroom was where Queen Victoria rested and received Baron Ferdinand privately during her visit on 14th May 1890. While one may easily be forgiven for thinking that the idea of mourning could have originated with Queen Victoria’s grief following the death of her husband Prince Albert in 1861 this exhibition shows that in fact the origins are earlier. The centrepiece in the Green Boudoir is a small photograph, perhaps from a locket, of Ferdinand’s wife Evelina and their stillborn child who both died in 1866 just eighteen months after their marriage. 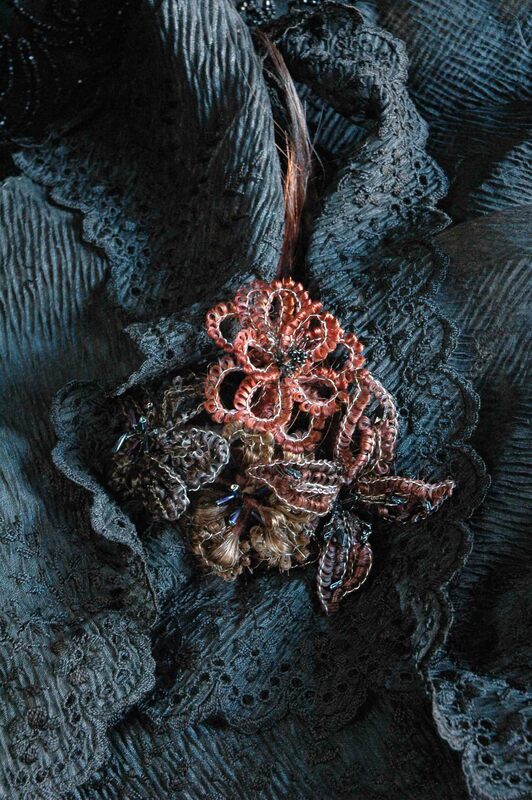 One common theme in commemorating the departed was human hair and the artist Jane Wildgoose has created new works using hair and they are seen alongside items from Royal Collection, generously lent by Her Majesty The Queen, the Museum of London, the National Maritime Museum, the Victoria and Albert Museum, Waddesdon and private collections. 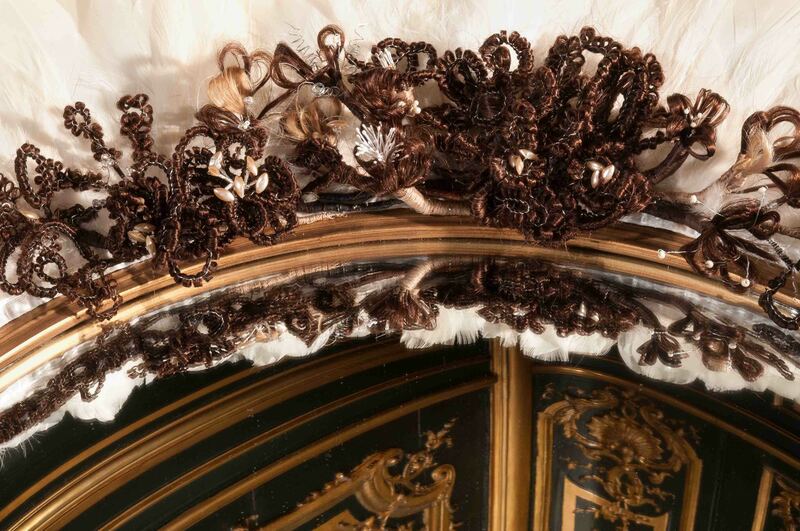 Jane Wildgoose: Beyond all Price in the Green Boudoir at Waddesdon Manor. Join artist Jane Wildgoose for an introduction to her exhibition Beyond all Price with a chance to view the installation in the Green Boudoir in her company. This entry was posted in Architectural Fittings, Contemporary Art, Costume, Decorative Arts, Fine Art, Gold Objects, Installations, Interior Decoration, Jewellery, Miniatures, Portraits, Textiles, Visual Arts, Works of Art and tagged contemporary art, Decorative Arts, Fine art, interiors, Jewellery, Royal Collection, textiles, Visual Arts, Waddesdon Manor.